Bubble tea is on the rise. Look no further than Google Maps and you’ll be sure to spot countless swirling, colorfully named tapioca bars that weren’t there only a year ago. It can feel like every other post in your Insta feed features that bright pastel straw and milky cup filled with balls of tapioca. And tell your mom that it’s not just a phase. Researchers for Allied Market Research are confident boba tea is more than a trend and it won’t be going away anytime soon. Metaphorically, it’s everywhere. But if the news is true that Starbucks is including boba on its menu, it would soon be quite literally everywhere. In case you somehow don’t know what bubble tea is, it’s a milk tea with tapioca pearls originating from Taiwan. Bubble tea can be made with any variety of tea but most popularly comes in black, green, white or oolong. To see this trend up close, look no further than Georgia State’s Downtown Campus. Within the past year, one boba place, Eastwave, closed down and before you could blink, two sprung up in its place. And it’s getting closer. Kung Fu Tea just recently opened at the corner of Park Place Avenue and Edgewood Avenue. Chris Nguyen is an owner of Kung Fu Tea, Downtown’s newest boba tea shop. Kung Fu Tea is a popular American boba chain, controlling over 20 percent of the American boba market. Nguyen’s franchise owns locations in Duluth and Buford Highway. Nguyen has been to business and networking conferences for the restaurant industry and said he’s seeing boba more and more lately. “There’s places in New York or Houston with multiple boba stores competing on the same block,” Nguyen said. The reason for its success is fairly simple, Nguyen explained. He sees Georgia State students and faculty through his store daily and notices boba sells like any other traditional western treats. “Do you like cake? Everyone likes dessert,” Nguyen said. Doris Kung, president of the Taiwan Student Association at Georgia State, has noticed similar parallels between the Taiwanese boba and American coffee cultures. She said in Taiwan, boba is often a daily indulgence. The sweet syrup and tapioca balls are a wonderful way to get caffeine with a chewy little snack. Nguyen said boba definitely has that daily coffee shop feel—it’s just newer to the game. “People drink it just like their morning coffee,” Nguyen said. Like American coffee culture, boba tea is easily customizable—even more so than coffee. When you place your order at Kung Fu Tea and many other stores, cashiers will ask you how sweet you want your drink on a 25 to 120 percent scale. While traditional boba comes in recognizable tea flavors, it can also feature more adventurous fruits such as green apple, mango or pineapple. And, while it may be milk tea, it’s not required to be cow milk; most boba stores are more than happy to serve soy and almond milk substitutes. 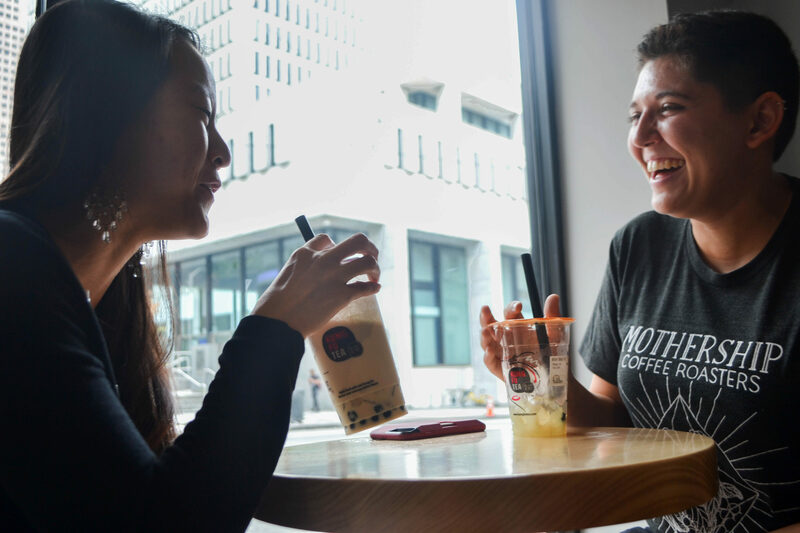 Nguyen said that while Asian-Americans may have helped to spread the popularity of boba in the U.S., at this point they are no more significant to his businesses than any other demographic. At Kung Fu Tea, they use a consumer data service to collect data on customers. What they have found is that when compared to the demographic of the areas they serve, their customer base is fairly representative. Nguyen takes it as encouragement that they seem to be successful among many groups. “The store is pretty diverse. The Asian population only makes up 30 percent of their business,” Nguyen said. While boba tea might be making headway in the United States, it is still strongly associated with Taiwan. Despite having only been invented in the 1980s, Kung said that in the region of east and southeast Asia, boba remains iconic to Taiwan. People from surrounding countries appreciate boba and celebrate its success. According to Kung, the attitude is that it is nice to see neighbors prosper. The milky tea drink is so identified with the country, it has become a part of the tourist experience. “Travelers and visitors have to try boba to [prove] that they have been to Taiwan,” Kung said. Joan Chen is a recent Georgia Tech graduate born in Taiwan. She feels excited that boba has spread to the United States. Because she’s so far from home, she finds it comforting to be able to grab a quick piece of home in her new Atlanta residence. “I find it really interesting to see that such a big part of Taiwanese culture is now taking on a bigger role in the world too!” Chen said. Cultural exchange is also exciting for Kung. As the president of the Taiwan Student Association, it makes up much of the work she does as a student leader. “I appreciate that as boba is getting more popular, more people know about Taiwan. Taiwan is a beautiful island country,” Kung said. So when the newest boba shop comes to Woodruff Park, let yourself get curious. It’s not going anywhere anytime soon.